Ceridwen is the Great Mother Hen who gives birth to Taliesin the Great Poet. She is the Welsh Mother Goddess, associated with fertility and fecundity. She is the eater of corn (Taliesin was disguised as a pile of corn) - food of earth and sun ripened, transforming in her cauldron womb into new life. In many of the world’s cultures, the egg represented the original source of creation - the Cosmic Egg - from which the universe was originally born. 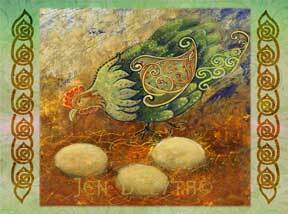 The Great Green Hen is symbolic of hope and rebirth, her gift of eggs a magical source of life and growth. "Had I the heavens’ embroidered cloths, enwrought with golden and silver light, The blue and the dim and the dark cloths, of night and light and half-light, I would spread the cloths under your feet. But I, being poor, have only my dreams; I have spread my dreams beneath your feet; Tread softly because you tread on my dreams..."